Amongst the charges against Lutfur is that he met with the Imam of the Grand Mosque at Makah. I would have thought this was something that Lutfur should be praised for as the Imam is a respected religious figure. The Imam of Mecca was invited to come to Tower Hamlets for a prayer which is very unusual. None of the leaders of any other faith was invited. The visit was unannounced and was done in secret until the last moment when there were photographs in The Times. This caused a great deal of suspicion. In the Brick Lane area funding was switched from a secular heritage trail to a most controversial Hijab sculpture. The meeting with the imam happened in my last week at the East London Advertiser in October 2008. I’d received a tip that the meeting was taking place and sent our photographer, Carmen Valino, and a reporter, Aman Pattar, to seek an interview. THE First Imam of Mecca was in London’s East End today (Monday) to meet local council leaders for a “private meeting” at Tower Hamlets and conduct prayers for Town Hall staff. Later, thousands of Muslim worshippers heard Sheikh Adil Al-Kalbani speak after evening prayers at the huge East London mosque. The sheikh arrived at the council’s Anchorage House HQ in Blackwall at lunchtime and led the prayers before emerging in his white robe with gold lining, accompanied by council leaderLutfur Rahman and others to walk the few yards to the Town Hall next door for the meeting behind closed doors. His entourage rushed him into the building past a waiting photographer—despite the sheikh indicating he was willing to meet the local press. The Town Hall remained tight lipped about the meeting and would not disclose what was being discussed. Tonight, Sheikh Al-Kalbani arrived at the East London Mosque in Whitechapel, which is planning an expansion programme, to led the evening prayers before addressing the congregation estimated at around 4,000. Al-Kalbani was in London as guest speaker at Sunday’s Global Peace and Unity event, the largest Muslim conference of its kind in Europe, which was held at the Excel centre in Canning Town. TJ: The meeting with Sheikh al-Kalbani at the town hall last year (2008)…what was that about? So that’s all he said and he said goodbye and he went, that was it. He’s a very pious man. TJ: What I don’t understand about that is that when we asked about it at the time, you didn’t say that. You, well not you, but your press office, said this was none of our business. LR: No what it was. I’ll be honest with you. It was just the way it happened. He led the midday prayers in Anchorage House and all the staff were invited. Whilst they were walking from Anchorage House back to Mulberry Place [the town hall] you had a Sikh guy [ELA reporter Aman Pattar] and a photographer just clicking away. I found that insulting. This is one of the most pious men in the Muslim world. We were really grateful and they’re not involved in politics, it’s their duty to lead prayers and recite the Koran and that’s their duty and that’s it. To be clicking away was just insulting. There were no secrets. There was no secret agenda. TJ: Was there any discussion about any funding at all [for the East London Mosque]…? Some six months after Lutfur had that chance cup of tea, Sheikh al-Kalbani was reported by this website as having had a conversation with someone from the BBC. Asked about his position on freedom of worship in the kingdom, Sheikh Kalbani said that “religious freedom has its limits,” before returning the ball to his BBC interviewer. “Will the Vatican allow the construction of mosques on its territory? “In any case, the Kingdom is the Qibla of Muslims (to whom they turn for prayer). So, not a single church bell will ring in the Saudi territory! “We only apply this commandment of the Prophet: ‘Expel the Jews and Christians from the Arabian Peninsula,” he stressed. “But their expulsion is up to the rulers and their stay (in the Saudi territory) is dependent on the extreme need of the country for their services,” he noted. Hardly the stuff of the One Tower Hamlets community cohesion brand coined by Lutfur and his officials a couple of years ago. The meeting with the imam continues to cause controversy. As a result of raising it again, Abbas is now receiving bucket loads of abuse, both in some of the Bengal newspapers in Tower Hamlets and also on some of the dubious satellite TV stations (more on them another time). They are saying he is anti-Muslim. That seems a bit strange, to say the least. For legal reasons, I am not allowing comments on this thread. What is really insulting about this is the misrepresentation of Abbas’ position – very deliberately – to drawn sectarian votes away from him – it’s disgusting. Lutfur should be condemned for exploiting the visit of a religious figure in this way. A formal reception with the Mayor should have been offered to the Sheikh – in fact only Councillors linked to Lutfur were offered the opportunity to meet with him. 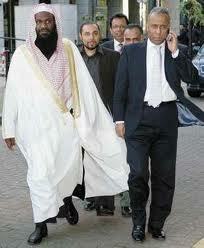 It actually seemed a bit disrespecful that Lutfur talked on his mobile phone while walking with the Sheikh as well.